Also on the EQ2MAP page of the utility add eq2ui_popup_add_poi.xml to the Ignore List so the EQ2MAP Updater won't overwrite the file. The Login window has been returned to the UI with a tabbed character selection list similar to the Shutdown (Camp) window. It uses the same data, so no extra configuration is needed. If you prefer to log directly in to the game without using the Launchpad, you will have access to all of your characters once again. Note: If you previously checked the Skip checkbox on the updater in order to use an older version, remember to uncheck it so you can get the new version. DarqUI_Notify has been redesigned and offers two new features. In addition to checking periodically for DarqUI and EQ2MAP updates, v1.2.0.0 offers the new URL Helper which opens Web links in your Windows browser instead of the in-game browser. Using the helper also gives you access to an in-game command to invoke Fullscreen Windowed Mode. This mode improves the experience of opening your Windows browser while playing, without reducing the game size as in standard windowed mode. Configurable sounds have been added to the new group and raid /countdown command. This is an experimental mod, so it's not on the DarqUI updater. Unzip and drop the file below into your custom UI folder if you want to try it out. Sound variables are near the bottom of the file if you want to change the sounds. You can configure a separate sound for each of the five seconds and the "Begin!" display, as well as turn on/off the feature. Parse character's entire history or narrow the results for today, current week, past 12 months, etc. 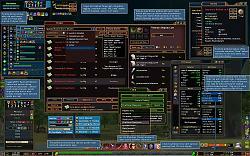 DarqUI Unified combines the best of DarqUI, DarqUI Live and EQ2Inventory into one, with some useful new features. Standard DarqUI users can now choose to make quick, permanent configuration changes right from the game screen while playing, as an alternative to loading up the external window utility. There is no longer a limit to the number of characters that can be customized, and many of the settings that were previously shared by all of your characters can now be configured for each character separately. DarqUI Live users can take advantage of an all-new configuration app with features like Quick Setup, backup and restore, character and spell file maintenance, and a new lookup feature that queries Daybreak servers for spell lines and icons to use for your spell buttons. The DarqUI Unified configuration app has been rewritten from the ground up to provide all of the conveniences from the DarqUI Window Utility and the Live Updater. 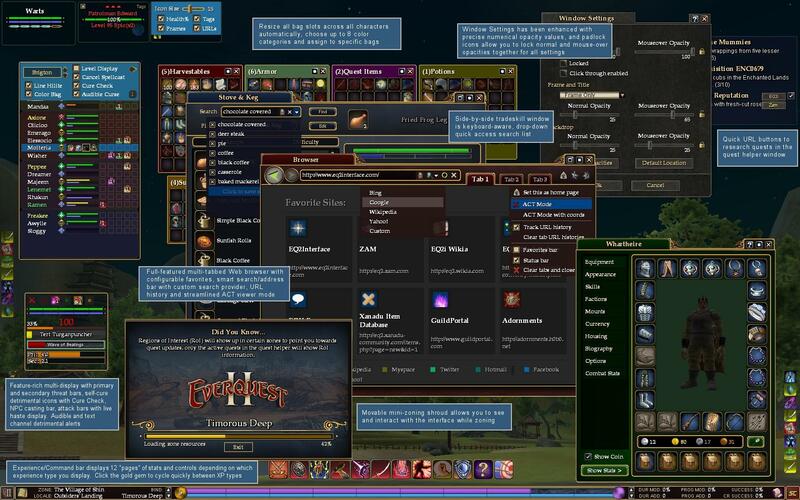 You will find many usability improvements and an uncluttered design that matches the familiar in-game window manager. Large size windows DarqUI Unified offers larger-size versions of many windows to accommodate higher resolution monitors. Choose the size you prefer from the Updates page of the utility. These include Active Journal (quest helper), Casting Bar, Chat, Dissonance, Examine, Experience Bar, Group, Implied Target, Maintained Spell Monitor, Maintained Spells, Mercenary, NPC Spell Monitor, Pet, Player, Raid, Savagery, Target, Threat and Tracking. 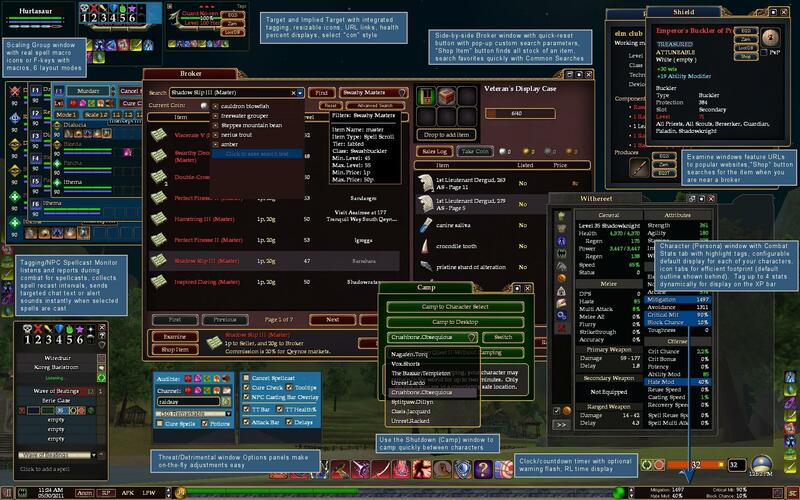 DarqUI windows that were already usable with higher resolutions include Detrimental Effects, Gear Buff Macros, Hotbars, Icon Bar and Spell Effects. EQ2Inventory Track and search equipment, bags, bank, shared bank, house vault, Wardrobe contents, mount and Familiar collections and up to 9 houses, guild hall and player-made dungeons per character from the DarqUI Unified interface. Chat Log Parser features keyword, category and date/time searches that recognize English, German and French log files. Use the preset category filters or build your own using regular expressions. EQ2MAP integration Install and update the official EQ2MAP alongside DarqUI with a single click. Help system Help files are now available for all DarqUI Unified windows and utility functions. Context-sensitive help information can be accessed externally from the window utility or from the window manager in-game. Use the new, more robust "Make default" feature on the Files page of the utility to set DarqUI as your default. This will prevent needing to use /loadui from the game window which crashes the awesomium browser. Spell Suggestions There is a new French spell suggestion file in addition to German and English. DarqUI Unified Notifications is a Windows tray icon that checks periodically for DarqUI and EQ2MAP updates. More information for setting up and using DarqUI_Notify can be found here. The app is optional, and is included in the download on this page. I really like the idea of this, although my xml is pretty rusty would like to get this to start at 10 and countdown through 1. Thanks again for the awesome work!! Posting in forum instead. Sorry. read that a bit too late. Last edited by grusen : 03-28-2019 at 01:34 PM. We have a new forum! Please post your questions and issues here, which hopefully will make finding the answers easier. Thanks! I don't see any errors but none of the settings (macros etc.) are coming back. I just tried some backups/restores and the Icon Bar and XP bar are both restoring. Are you getting three green checkmarks in the restore window? You can also go to the Files page in the utility and click "View the log file" to see if there is anything askew. Each restored file will be listed. Darq, I have multiple backups from within the program but when I restore one it doesn't bring back specific character settings like my Iconbar settings, or my experience bar settings. Is there a trick to this or is it broke? Last edited by sengelso66 : 03-16-2019 at 03:44 PM. Awesome.. I added the line. My helper is on the task bar and looks to be working fine. I checked the settings and it still has the "Use Browser" checked. Also when I click the buttons I do see the chat text come up I just don't get a browser to open like before. I just re-extracted a copy of notify.. Yeah I shoulda done that before I asked questions but my brain is addled lately. I'll get back to ya and see if it worked. Thanks for the help! Ah ha!! Found the problem.. My game /log got turned off somehow.. I turned it back on and it works again . 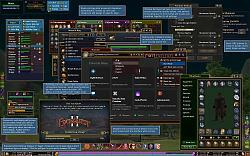 The Add POI window needs to be added to the EQ2MAP ignore list, otherwise it will keep getting overwritten. On the EQ2MAP page of the utility click Ignore list, then add eq2ui_popup_add_poi.xml to the window that appears. The next version of the DarqUI utility will handle this for you automatically, but for the moment it has to be added manually. The URL Helper is working for me, and I also received the Windows updates. Make sure the URL Helper is running, and that there are no errors in the notifier app. It should look more or less like this image. Are you seeing the DARQUI_URL chat lines in-game when you click a link button? Re: add a . to damage reduction? Fantastic!! it is now showing up. I would like to add one little request. 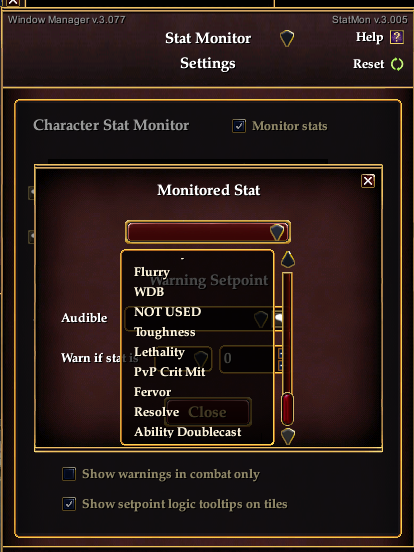 My default damage reduction is 10.2, but it shows up as 102 in the Stat Monitor. Any chance we can get the "." to show up? I want to thank you again for your time and effort in this mob. Its fantastic! Go back and download the Window Manager one more time, it should be version 3.079. Values like 102 should be converting to 10.2%. If not, please post again. Hi again.. Sorry to bother.. But, Windows had an update and now the part where the buttons open the default browser doesn't work any longer . I reallly want that back so do you have any ideas? I hate the idea of reinstalling the whole thing so is there a fix? Also the Add POI keeps prompting me to update every time there's a check.. Are you still tweaking it or is that a bug? add a . to damage reduction? Thank you. I bring up State Monitor and the last thing I have on the drop down is Ability Doublecast. The change you requested was placed on the update server, and you'll need to use the DarqUI utility to download the new files to your computer. I should have been more explicit about that. Last edited by Holyduke1234 : 01-09-2019 at 12:11 AM.